We used water fleas (Daphnia) facing predation risk from midge and fish predators to answer a longstanding question about whether phenotypic plasticity could be locally adapted. Phenotypic plasticity is the ability of an organism to change its phenotype during development in response to changes in the environment. This flexibility in how organisms develop has fascinated researchers from developmental biology, evolutionary biology and ecology. It has emerged as a major consideration in how animals and plants respond to natural and anthropogenic environmental change. 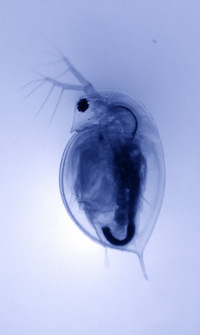 We’d been studying phenotypic plasticity in Daphnia pulex (a small water flea) for several years, focusing on their iconic response to chemical cues of risk – essentially smelly water - from their predators. This is often termed the study of the 'ecology (and evolution) of fear'. When D. pulex are exposed to smells from their small, invertebrate midge larvae predators during embryo stages of development, they do a series of remarkable things. One of our D. pulex genotypes used in our experiments. The set of traits that change - including morphology, size at maturity, age at maturity, growth rate and reproduction - fascinated us because it emphasised an emerging idea that phenotypic plasticity was not a single trait phenomenon, but a whole-organism phenomenon. 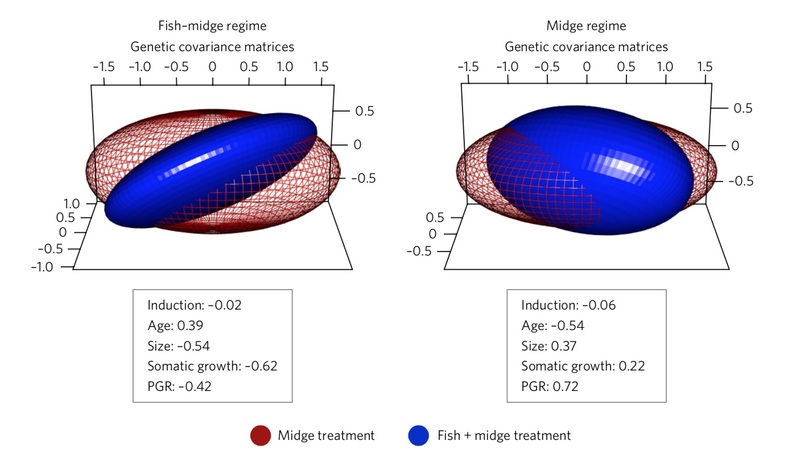 We spent several years collecting unique genotypes, experimentally manipulating their exposure to chemical cues from midge and fish predators, measuring their phenotype in multiple environments (plasticity) and developing statistical tools to model genetic variation in a multi-trait response to environmental change. This ultimately led us to this work and our main question: can we detect local adaptation of phenotypic plasticity. We were able to ask this question because we had noticed that the ponds we were collecting from sometimes had only midge predators. But other ponds had both midge and fish predators. This presented a unique natural experiment where we could look at multiple populations from these historically distinct evolutionary backgrounds. We were able to specifically ask whether the genetic variation in multi-trait phenotypic plasticity differed, consistently, between these different backgrounds. Overall, it remains a satisfying mix of natural history, experimental ecology, quantitative genetics and statistics. And it appears that the flexibility organisms show to variable environments is itself locally adapted.